What Is Known As an Ex-Parte Divorce? 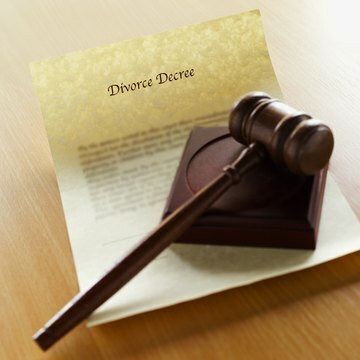 When a couple divorces, in most cases the divorce proceeding takes place in the state where the couple lives. However, some circumstances may arise where one of the parties is domiciled, or has legal residence, in another state, and does not participate in the divorce proceeding. This is called an ex-parte divorce. Generally, a court can hear a divorce case if one of the spouses resides in the state or county where the court is, even if the other spouse lives in another state. To obtain a valid ex-parte divorce decree, you must ensure that you provide your spouse who is residing in another state with proper notice of the divorce proceedings. If your spouse receives proper notice, chooses not to participate in the divorce proceeding and you meet all other procedural requirements, the judge will grant an ex-parte divorce. Since each state has different jurisdictional and notice requirements, it is a good idea to consult an attorney before you file for divorce, or to use an online legal document service to prepare and file your divorce paperwork. Divorce is a complicated process that involves a variety of issues. A divorce decree terminates the marriage, divides the former couple’s marital property and establishes custody terms for the couple’s children. While you can file for divorce in Illinois at any time, you or your spouse must have lived in the state for 90 days before an Illinois court can enter a final judgment of divorce. You can contest the validity of a will in Oregon if you have a legal reason and a connection to the estate such as being an heir of the deceased person. Three different reasons, all found under Section 113.075 of the Oregon Code, exist for legitimate will contests: You must prove the will is ineffective, another will exists or the testator -- the person to whom the will belongs -- made promises about the will he did not keep. A will may be found as ineffective in Oregon if the testator was mentally incompetent at the time of execution, unduly pressured about the will, or if fraud and mistakes were committed during the will's drafting and signing. You may contest a will as soon as you learn of its existence, terms, or the initiation of probate proceedings, which is the legal process used to validate a will and settle an estate.